Akansha often slept in her shoes. She would come into our room, set multiple alarms on her phone, and flop into bed with her shoes on. I wondered about this for a long time until I realized, itâ€™s so she doesnâ€™t ever get too comfortable in bed. 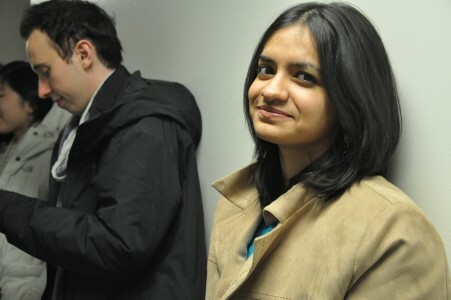 Akansha is a chemical engineering major at Northwestern University. She does research for professors whom Iâ€™ve never heard of on campus, the kinds who’ve won multiple awards and have their own parking spaces. Akansha likes her assorted nuts, her momâ€™s homemade Indian snacks, and sleeping. She seldom gets much sleep because it â€œisnâ€™t whatâ€™s pivotalâ€ to her at this point in her life. Akansha was 8 when she took an entrance exam for a private all-girls school. In Bangalore, it was known as the best school around. She knew she would get in. She was the smartest girl in class. Her parents had absolute faith in her academics. When she got an envelope in the post notifying her she didnâ€™t get in, she went to inquire. Her father went with her to make sure she didnâ€™t get lost amidst the big school buildings. When an eight-year-old walked into the principalâ€™s office asking why she wasnâ€™t admitted to a school she knew she deserved to be, they couldnâ€™t lie to her. Even more unusual than a child standing up to authority would be for them to lie. They confessedâ€”she had gotten everything correct on the exam, and they allowed her into the school. She had earned that spot and she knew it, though she didn’t know why they had initially said no and were changing their minds. Her father stood silent. If I were to imagine our old room and walk into it right now, Akansha would not be in it. She would be in class. Our desks would be positioned right by each other as if to suggest how different our lives were. My bookshelf would have novels by Murakami, Nabokov, Morrison and Eugenides, a camera, and some journals, whereas her bookshelf had just one thing: a plastic model of an atom. At night she would pore over the piece of plastic art with furrowed concentration, as if she were deciphering an ancient language I could never understand. Akansha and I had very few mutual friends. But the ones we shared asked me about her all the time. Does she ever relax? Every time that happened, I felt an intense obligation to defend her. Or, I felt like I had to, because I knew she was too proud to stoop and explain. As the eldest daughter and the only child her parents sent to America, she had a duty. She was a lucky girl to be given such an opportunity. And it was an opportunity she wouldn’t let pass. Akansha’s father had filled her in on the opportunity she as an eight-year-old almost missed. The all-girls school had turned her down because he hadn’t come through with a bribe to get her in.